In the year following its formal founding, 1873 marked several major developments for the fledgling town… the first steps towards a significant city. Despite promising expectations, a looming national financial crisis would impede progress. Initial growth was rapid. By spring, some sixty-to-seventy buildings had been erected, many of them saloons and others of “ill-fame.” Nearly all of the structures were log buildings and tents that were quick to assemble and could be easily relocated. This was essential given the ongoing townsite contest. One correspondent’s telling in a May 21, 1873 Minneapolis Tribune article states that the town boasted a brewery, pop factory, three billiard halls, three restaurants, four hotels, and a handful of other businesses, including a grocer and drug store. The Shaw & Co. store had already reportedly sold more than $60,000 worth of merchandise since its 1872 inception, operating from a 100×25-foot store. The store had also diversified into banking operations, with many deposits topping a thousand dollars. The town’s estimated population had swelled to nearly 1,000 people and ambitiously projected to reach 5,000 by winter, according to an 1873 Minneapolis Tribune article. In reality, that population count won’t officially be achieved until the 1920 Census. Edwinton was renamed Bismarck in May, with its name-change officially recognized on July 17. Named after Germany’s “Iron Chancellor” Otto von Bismarck, the change in name was an attempt to attract German settlers and investors. By this time, Bismarck reportedly had 147 buildings. The rail line through Bismarck was completed on June 4, 1873 with the first train arriving the following day. The line directly connected Bismarck to Lake Superior. Fare was five cents per rail mile, or $29.75 from Minneapolis-Saint Paul to Bismarck. Burleigh County was organized on July 9, 1873 with Bismarck chosen as its county seat. James Emmons, William Mercer, and John Dunn, all of whom later have counties named for them, were its first county commissioners. Among their first acts were naming Bismarck county seat, establishing a $25 liquor license, and appointing Linda Slaughter as school superintendent. Linda Slaughter, wife of Camp Hancock’s post-surgeon Dr. B.F. “Frank” Slaughter, was another of Bismarck’s most influential pioneers. She established Bismarck’s first public school inside the Congressional Church by fall. She had previously established a Presbyterian Sunday school from a tent at Camp Hancock in August 1872. The Bismarck Tribune published its first edition on July 11, 1873. “Little Casino,” whose aliases also included Isa Lewis and Elizabeth McClelland, also arrived at about this time and established a successful “resort” – otherwise known as a brothel – at 701 Front Avenue. Her operation later expanded, until 1893 when a foreclosure forced her out of business. The Panic of 1873 – a national financial crisis and depression – soured Bismarck’s promising future, hastened by Northern Pacific’s bankruptcy in 1875. 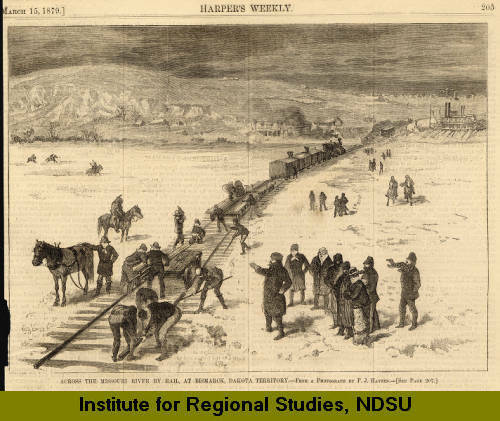 This illustration from Harper’s Weekly on March 15, 1879 depicts the railroad’s crossing of the Missouri River on ice. Construction halted on the incomplete railroad. While much of the line was already completed, a gap existed between the east and west links and no bridge yet spanned the Missouri River. As weather permitted, trains were ferried across. In the winter, temporary tracks were laid across the frozen river. Nonetheless, rail travel was greatly restricted. The line virtually ended at Bismarck for nearly ten years. Financial woes, limited rail traffic, little industry, and uncertain land claims stunted growth and development. Only buildings deemed essential were constructed, by the least expensive means possible. Bismarck depended almost entirely on military men, nearby mining excursions, and those operating river freighters. Even agriculture had yet gained traction. The discovery of gold in the nearby Black Hills in 1874 was arguably the fledgling city’s saving grace. The discovery sparked a sudden gold rush that lasted until approximately 1878. Ironically, it was the railroad’s sudden end in Bismarck that propelled Bismarck’s initial growth. Most of the prospectors arrived via the railroad to its terminus in Bismarck before setting out on their journey to the nearby Black Hills. Nearby Fort Abraham Lincoln, headed by General George Armstrong Custer, supported military excursions relating to the gold discovery. Alexander McKenzie, who later became one of the area’s most influential political figures, was elected sheriff on December 24, 1874. He replaced Sheriff Charlie McCarthy, who, along with Deputy Clint Miller, drowned after falling into an air hole in the river. McKenzie was also the county’s first elected sheriff. The W.B. Shaw store sold roughly $150,000 worth of merchandise in both 1873 and 1874, its final year in business. Within its first two years, Bismarck swelled to an estimated population of 1,200-1,400 citizens. There were six hotels, eighteen saloons, eight billiard halls, one bowling alley, one drug store, two churches, three physicians, and a handful of other enterprises. 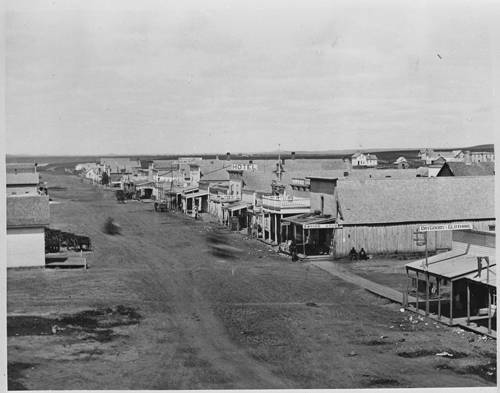 Bismarck was incorporated as a city on January 14, 1875. Edmund Hackett is appointed the first mayor until a formal election is held in April, when John McLean is chosen as the first elected mayor. In 1876, the region received national attention when Bismarck Tribune reporter Mark Kellogg was first to report on the massacre at Little Big Horn, popularly known today as “Custer’s Last Stand.” Kellogg himself was killed during the battle. A major fire destroyed much of Bismarck’s business district in March 1877. The resulting damage was estimated at $22,000 – worth nearly half a million dollars today. It was the first significant fire for the new town, and not surpassed until the great Fire of August 1898. The fire originated at 3:00 a.m. on March 15th inside the Arcade saloon, which had been bought out only the day prior to be converted into a tobacco store. Miners Hotel, Ostland’s Livery Stable, Joe Hare’s Billiard Hall, John Dunn’s drug store, John Yegen’s Bakery, John Boyle’s saloon, and Western Hotel. While not destroyed by the fire itself, Sloan’s Meat Market was dismantled to stay the fire. The recently ordered fire engine had not yet arrived and the town didn’t even have hocks and ladders at their disposal to fight the fire. Within about a week, Dunn – who suffered the largest lost at $7,000 – purchased and relocated the former Congregational Church to re-open on the same site. John Yegen was less fortunate, losing his naturalization papers in the fire. Ironically, the Bismarck Fire Department was founded five days later, on March 20, 1877, as the Pioneer Hook and Ladder Company. 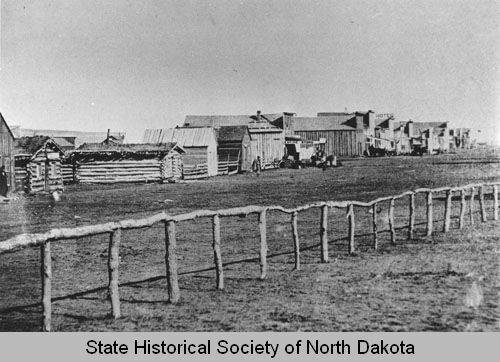 Also in 1877, George Stark, ex-president of Northern Pacific, commenced the area’s first significant agricultural operation on 100 acres of land he owned five miles southeast of Bismarck. He brought in workers from Minnesota to break the sod. The first schoolhouse was constructed in 1877 at the southwest corner of Thayer Avenue and Sixth Street. The second bank in Dakota Territory, First National Bank, opened at corner of 4th Street and Main Avenue two years later.